Every parent wants their child to have a memorable birthday and I’m sure that you are no different. You want your child’s eyes to light up when they find out what you have planned for this year’s birthday celebration. You’re a parent who wants to do something different, creative and fun for your child’s birthday – so why not find an art studio that can host art parties? As a parent, you want to see that huge smile that just melts your heart and gives you sheer satisfaction in knowing that this year’s birthday celebration will be truly special. Creative parties are a great way to ensure that your child and their friends will have a fun and creative birthday experience. Year after year it can be a challenge to come up with a unique birthday party idea that is inspiring, fun and creative. Each year you ask yourself what you can do this year that will really stand out among previous years. 1. => Art parties give children a chance to explore their creative side while having fun. They provide a memorable birthday experience that gives each child a chance to creatively express themselves often while experimenting with new and different ways of creating art. Children are always learning and growing and art parties are the perfect place where they can nurture their budding creative skills. 2. => Art parties provide more than a loot bag as a take home gift for children. The birthday boy or girl will experience a sense of pride in seeing what they were able to create at their birthday party and each attendee will have a creative piece of art that they can take home and display in their home for friends and family members to admire. These creative parties help children to continue building a sense of pride in their creative and artistic skills. 3. => Art parties can provide children with an opportunity to learn a new art skill. Art studios offer art parties that can involve creating sand art, fabric art, eco art as well as a lot of other fun and creative art forms. Each child will have a chance to learn a new and creative art skill that will only enhance their creative learning abilities. 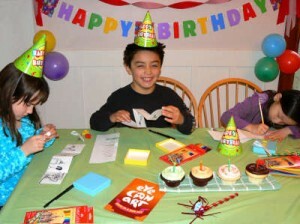 These creative parties can inspire creative learning in a way that other birthday parties do not. They add to the natural birthday party elements of fun, food and gifts and take it one step further to enhance each child’s party experience. Contact Poetic Art Studio for more information about our art parties.